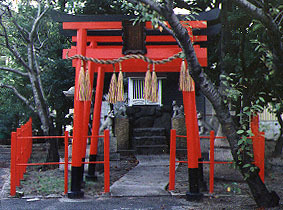 Torii gates mark the sacred entrance of Shinto shrines. Notice the fox spirits at this roadside shrine. Torii, Shinto, kamisama, shrine, road, beside, red, white, rope, trees, stone, foxes, o-mochi, oranges, offer. Religion, myth, colors, food, animals, nature.